However, I need to highlight that while most of the ingredients appear harmless,Â Sodium Hydroxymethylglycinate or Suttocide is used as the preservative.Â This appears to be aÂ plant-based derivativeÂ preservative withÂ naturally occurring amino acidÂ readily used in products that are 100% natural.Â Its toxicity level is undetermined as there have been no studies on the long term effects of using this and hence,Â I can’t say for sure this isÂ definitely safe.Â ButÂ I understand that it is impossible for the products not to use some form of preservative and this isÂ still acceptable to me especially when I compareÂ what is used inÂ the other most established conventional brands in the market. So what have I tried under Sukin and what do I like? This is great stuff which smells really wonderful!Â There is not much to review except that it does a good job of taking away my makeup and I’ll definitely buy this again. I won’t be buying this again only because IÂ don’t find aÂ hydrating mist toner useful for me.Â Â I like using toners but I love them with aÂ cotton pad.Â Â And to set my makeup, I always use a facial spray.Â Hence, this productÂ wasÂ quite a waste of money for me although I do use it every morning.Â A plus point is that it smells great. This is definitely comparable to L’Occitane Almond Apple Sweet Peel in terms of texture and feel but only at a fraction of the price.Â It basically does the job of a facial scrub but it isn’t fine if that’s what you’re looking for.Â I don’t mind it, but I’m not certain if I would buy it again. A very lightweight wonderful smelling moisturizer that acts as a humectant to soothe and hydrateÂ the skin.Â I like the fact that it’s non greasy and hence is great as a base before applying sunscreen and makeup.Â But if you’re looking for something richer, this isn’t suitable at all. Again, I’m into my 3rd bottle so this is another of my favorite.Â I love how my skin feels after using this.Â Soft and not drying as I have reviewed.Â Also smells fabulous.Â Â I’ll be buying more of this for sure because it is really value for money when compared with other range. This one I don’t love despite the lack ofÂ aluminum or parabens.Â Â It works in reducing odor alright but the spraying just don’t work for me.Â You can read about it in my full review.Â Â Not recommending it. Sukin organic range of products are only available at the Watsonâ€™s outlets at Parkway Parade, Ngee Ann City, Centrepoint, Great World City, Anchorpoint and Compass Point. Previous Post: « Anti-aging: chemical or physical sunscreens? parisb: The cleansers are good stuff. Let’s hope your local distributor will bring this in soon. chenyze: Ooops…missed that one out. Thanks! I am so glad to read your review! haha! I came across Sukin a few days ago at Ngee Ann City’s Watsons. As my face is giving me some problem, I was thinking hard if I should get it. Hmm.. from your review, I think i can give some of it a shot! I hope you’ll like it. It’s one of my favorites! I’ve only tried the toner last year. Sukin is available at selected Watson’s stores. I don’t use organic shampoo but I’ve heard good things about those from John Masters Organics and Nature’s Gate. Thanks for writing about this brand. I purchased their Facial Moisturiser and Cream Cleanser. Although I haven’t tested out the latter’s makeup removal abilities, it does rinse off well and keeps skin hydrated! I do love the Facial Moisturiser as I found it hydrates me well (I have combination skin) and has made me less oily throughout the day!! That’s great. Glad you like it. Not too sure as I haven’t compared them. If the ingredients are the same, then it could be just the branding. i ve noticed there is wheat germ oil used in sukin cream cleanser and moituriser. In your lidst that clog pores,wheat germ oil is on the list.will it clog pores inlong term? Hi Grace: It’s in the moisturizer but it’s in the middle, not too high up…so the content should not be a concern unless your skin is easily clogged. I didn’t see it in the cleanser though? I have combination skin, well oily t zone. Have large pores and blackheads, so yeah I guess its easily clogged? 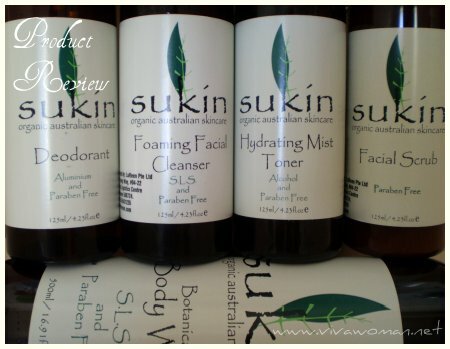 Have you try the moisturiser of SUKIN? 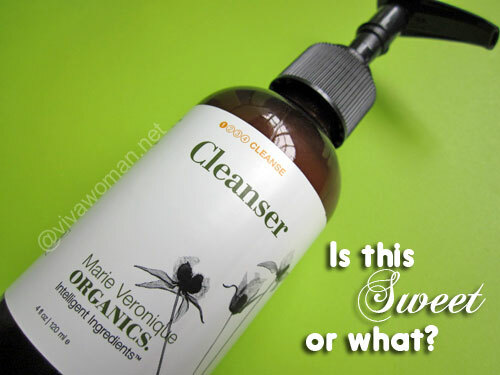 Yes I have and I had a brief review about it here http://www.vivawoman.net/2008/05/06/review-sukin-organic-product-range/. It’s okay, not not very great as it’s very basic. What organic moituriser would you recommend for oily t zone type? There are a number of formulations out there…depends on your budget too. You can try Living Nature or John Masters Organic for the high end ones. Tried some of their stuff and liked them. For affordable range, I really can’t say…Sukin is okay if you’re not going for anything fanciful. I think you need to go to the stores and check them out by feeling the texture too. iam in love with Sukin skincare line. it is affordable, good value for money and works just as effective as other high-end organic skincare line. iam currently using the Sukin shampoo&condition (got free Sukin hairmask for free), Night moisteriser, cream cleanser. love all of it. That’s great. I love them when I was using them too. Can anyone tell me if and where this product is sold in the Chicago IL, USA area. I was able to obtain one bottle of the Hydrating Body Lotion from “Home Goods” and have noticed a difference in the hydrating of my skin. I am diabetic and have extremely dry skin and this product really helps. I checked into ordering it online, however the international shipping charges are very high, when ordering 6 bottles, the shipping nearly doubles the price. I don’t think the product is available in USA now. It is from Australia and sold in some parts of Asia. You might need to try buying the product online.